Here’s how to go from “riding-in-a-convertible-while-dodging- the-rain” to “top-up” in a flash… while staying dry in the process! 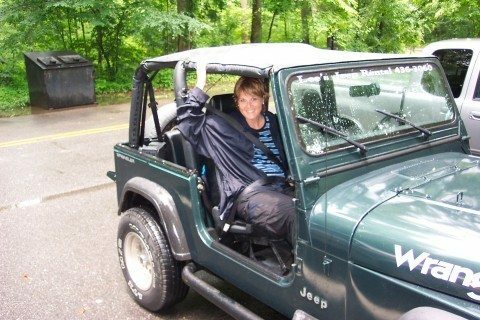 I took the Jeep out for a spin this morning (with the Sunrider top down, and the back window rolled up & out of the way), and I got caught in a sudden rain storm. Oh sure, I saw the skies darkening, but I only had “one more place to go” before I’d be back home — then the Jeep would be parked safe and dry in my garage. Fortunately I had already devised a complete “plan of attack” in my mind. And I encourage you to do so, as well — before you find yourself caught in a rain storm without a plan! Here’s how I managed to stay pretty dry — while also protecting the interior of my Jeep from what became more of a flash flood than a rain shower in the end. Even when the skies are gray, the wind is picking up, and you can hear the thunder in the distance, a die-hard Jeeper (or convertible owner) will attempt to get the best of Mother Nature by waiting until the very last minute to put the top up — usually, the very second that the first drop of rain hits the windshield. You see, convertible owners are highly optimistic by nature… Either we think we can “beat” the rain by staying one step ahead of the areas where it is actually coming down, or avoid it altogether by out-running the impeding rain clouds. It’s usually a chance (and a challenge) we’re willing to take. For best results, if you want to time it just right… before the first drop of rain even touches the inside of your vehicle, then your best bet is to watch the oncoming traffic. As soon as you spot the first car with a rain-soaked hood or windshield wipers flapping, let that be your sign that the rain is inevitable and it’s time to put the top up. Better yet, if you see water drops on the hoods and windshields of approaching cars (even though they’re not using their wipers), it would be in your best interest to put the convertible top up. My “plan of attack” would have been quite different had the entire soft top been down at the time of this rain storm — rather than just the Sunrider top and the windows removed. But, a few valuable lessons were learned today during my emergency Sunrider soft top assembly process. #1 While the Sunrider top itself can be closed and secured into place from inside the Jeep, I actually ventured outside of the vehicle to zip up the back window as the rain started to fall. So yeah, I got a little wet. Depending on the amount of rain falling, you could probably avoid this step since the rest of the soft top over the rear of the Jeep itself would largely protect the backseat/trunk area from most of the falling raindrops. Of course, your rear trunk area will undoubtedly get a little wet from blowing wind and rain. Since I chose to remove the rolled-up rear window from the elastic loops in the rear and actually zip the window back into place, I got wet — mostly because the zippers didn’t glide smoothly in my haste to get the job done quickly. So I’m going to try 303 Protectant to make this process go more smoothly in the future. It’s primarily for protecting your soft top, but it works wonders on zippers too. This product is so versatile, it can be used in a number of different ways to protect your Jeep! #2 Those straps that come with the Sunrider top which secure the Sunrider bars in place (during fast speeds when the top is open) may serve their purpose, but they’re not easy to take OFF in a hurry… and by yourself… and when you’re about to get caught in a downpour. UPDATE: I’m sure the biggest reason for those 2 Jeep straps involves some safety issue and/or the unnecessary wear & tear on the hinges of the Sunrider top. But I have to admit, we quit using them altogether after a couple years of owning this Jeep, and we’ve seen no “damage” yet. At first, we were nervous that high winds and/or the act of passing a huge truck at fast speeds would wreak havoc on those hinges. But much to our surprise, everything stays put. While just the right gale force wind at just the right angle could probably bust a hinge on the Sunrider top. But we’ve been lucky so far. So… I’m not recommending that you ditch the safety straps yourself. But just know that if you forget to use them once, or you’re in a hurry and don’t have a chance to secure them… you’ll probably be alright. As a rule though, they’re there for a reason and we all should probably use them. For Those Who Ride With The Jeep Soft Top Down… A Lot! On a related note, check out what we use to store and transport the vinyl zip-out windows from our soft top. It’s a Jeep soft top window roll up bag and here’s why we love it. And, the quickest & easiest soft top for Jeep Wranglers and CJs is the Emergency Jeep Top. It’s available on a moment’s notice when you’re driving without the soft top or hard top on your Jeep and it starts to rain. The best part: it’s compact & lightweight and stores neatly out of the way in its own storage bag. It even comes with 2 rain ponchos. Here’s anotherJeep vinyl window storage system. Just roll and store!